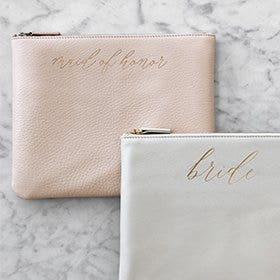 A true carry all wallet, the Trinity Checkbook Wallet is for the woman who needs everything at hand. A trifold silhouette, the Trinity features a checkbook insert that can be removed to open up spare pocket storage. 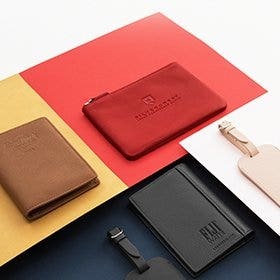 This design has 6 exposed card slots for your go-to credit cards and IDs and 2 interior card pockets for your less used cards. A gusseted coin pocket expands perfectly when full, but keeps a low profile when empty to keep the Trinity as slim as possible. Lastly, an inset pen pocket is sewn into one of the wallet folds for those days when you need to write a check. 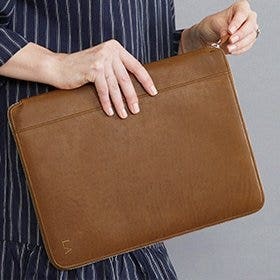 Checkbook wallets are still useful to many of us, but they can be hard to find, so I was happy to discover the Leatherology site—and thrilled to receive my new wallet! An instant classic. Quality, good design, fine workmanship. And the monogram was very well done. After I’d ordered it for myself, my husband saw how pleased I was and asked if it could be his Valentine’s gift. YES! And I plan to take another look at the site for other items as well. 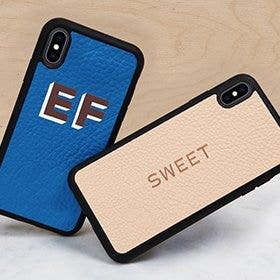 Another wonderful product from leatherology. I love that the checkbook and pen are so easily contained within this wallet without it making the wallet too big. 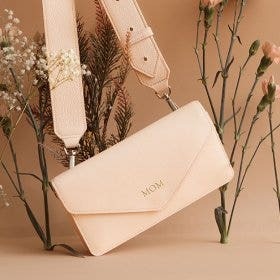 The leather is beautiful and I love the monogramming!! I’ll continue shopping at leatherology for their fine quality products. I have been waiting to find a larger checkbook wallet and the TRINITY is the perfect size. It is slender, opens and closes w/o no problems. I was really impressed. Only one regret-I should have gotten it initialed. Glad I found Leatherology. Excellent product and delivery. The return time could be lengthened since this is a Christmas gift. Thirty days isn't long enough. Otherwise, I'm very pleased. Finding a wallet with a check book holder that doesn’t look dated is nearly impossible now. This wallet is perfect, it holds almost everything that I need; my check book, a pen, receipts, 8 credit card slots, change and my cash. I’ll probably get an insert with more card holders which is a great option. 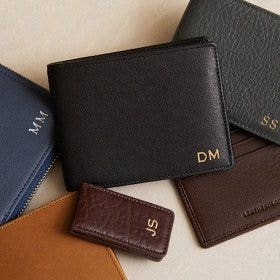 My wallet is everything to me, and this one keeps me organized. The turmeric color is gorgeous too. I’ve received compliments already. Bought an onyx black monogrammed Trinity Checkbook wallet for a birthday present. The recipient was absolutely thrilled and remarked how beautiful the leather looks and how well made it is. 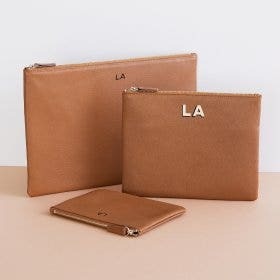 I am not sure I could love a wallet more! I love the style, the quality of the leather and the COLOR. The dusk color is beautiful. I have already had several people ask me where I got it. 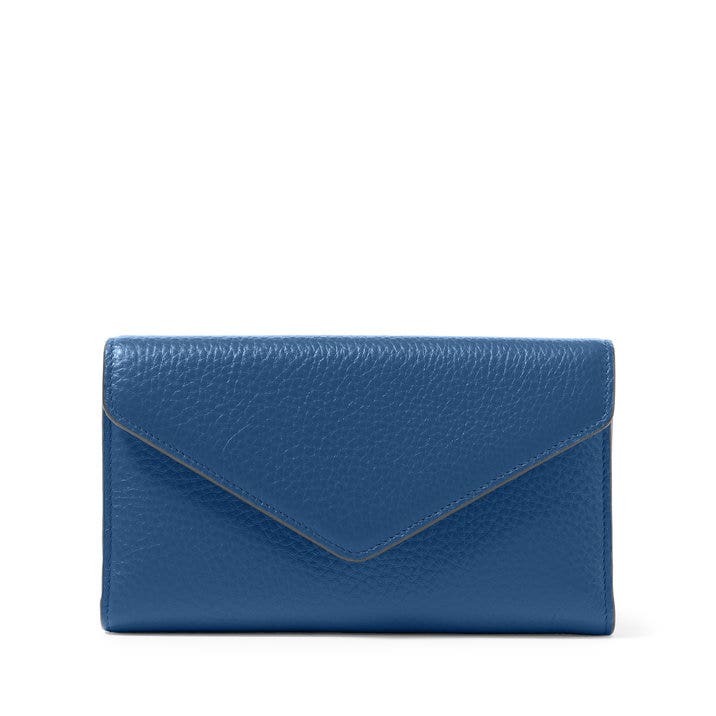 Envelope clutch? Please? Please? Please? 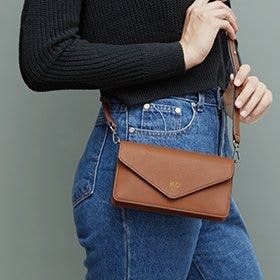 PS: Not essential, but if you did make an envelope clutch (clutch, not wallet) and put inconspicuous rings on each side, customers could also use it as a crossbody.